David Norris was called as a witness for the southern claim of John Horton. He testified of Hortonâ€™s loyalty to the union throughout the Civil War. He assured the interrogator that Horton never supported the confederacy in any way, and used only the most â€œabusiveâ€ and explicit language when discussing the confederates. Norris also stated that Horton did not help his son buy his confederate outfit, and Horton even wished that the first union soldier his son came across would shoot him dead. David Norris, “Witness for John Horton,” Southern Claims Commission Approved Claims, 1871- 1880, July 29, 1876, 1-4. I heard that a rebel command...took property from [John Horton] on account of his being reported as a union man. I have heard of [John Horton] doing all he could for the union cause, but nothing against it. I heard when his son James W. Horton went into the confederate service that he refused to a[i]de him in any way in his outfit, and that he was so much opposed to his [son] going that he said that he hoped the first union soldier he came up with, would shoot him down. 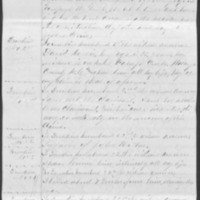 United States Government, Southern Claim of David Norris, July 29, 1876, Civil War Era NC, accessed April 24, 2019, https://cwnc.omeka.chass.ncsu.edu/items/show/320.